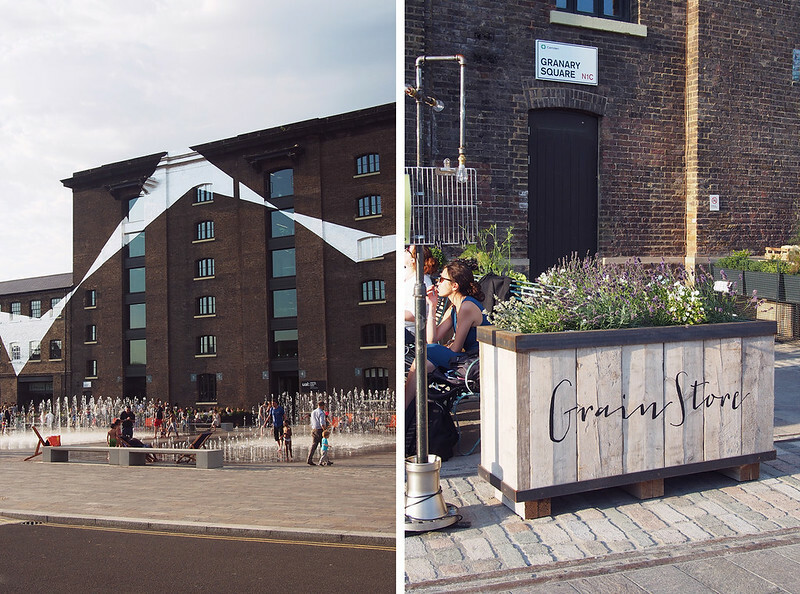 It’s great to see all the redevelopment in the Kings Cross area recently: it’s quickly becoming a really cool hub for food (see also Caravan, The Gilbert Scott and Kerb), arts (the new St Martins college campus is there) and fun (pop-up skate rink!). The beautiful new station concourse and renovation of the canalside area is making it a destination in its own right as opposed to just a thoroughfare. We tried to get into Grain Store – the latest addition from chef Bruno Loubert and the people behind the Zetter Townhouse – a couple of weeks ago but it was full, so we made do with Caravan but vowed to come back. The menu is pretty unique, and seemed utterly delightful to me at a glance because vegetables really take front and centre. There are meat and fish dishes too but they are written as if the meat is the incidental part which is refreshing. There are even dedicated vegan options – pretty rare for a mainstream restaurant, never mind from a French chef. 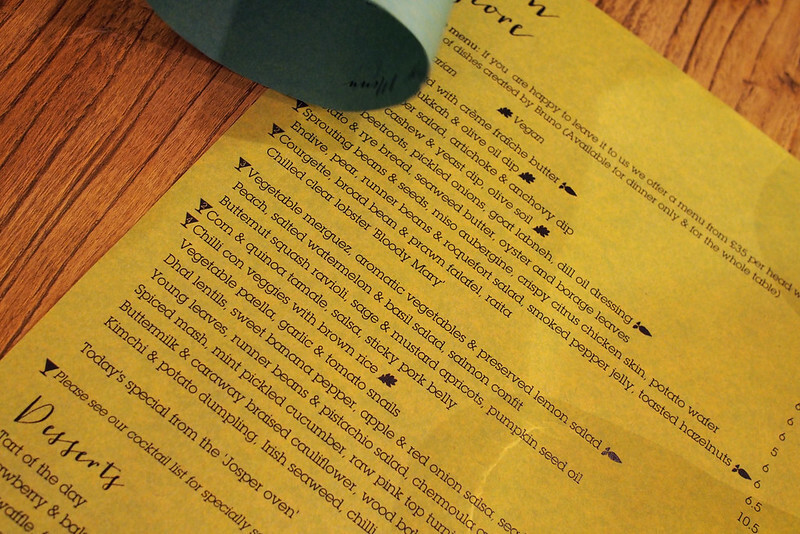 For the indecisive or adventurous diner, they offer a completely surprise menu devised by the chefs on the day for £35 a head, which is what we went for. In retrospect unfortunately I think this decision slightly marred our meal. Firstly, there was a loooong wait between each of the five dishes, explained by the waitress as the place being particularly busy that night. Secondly, I felt a little like the collection of dishes we were given all clashed and fought with each other rather than flowing and creating a cohesive whole, leaving us with quite an unpleasant sensation of our palates being assaulted and ultimately overwhelmed by the end. 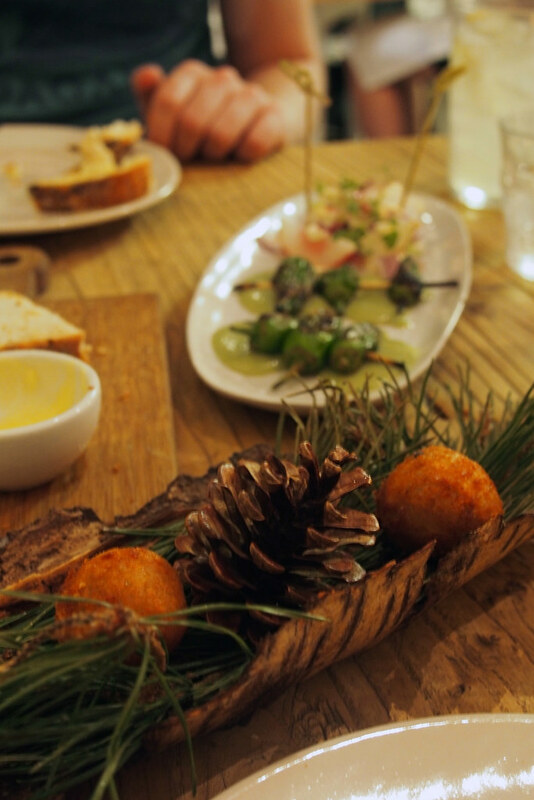 There were definitely high points however: warm onion bread started the meal promisingly and I loved the first dish of rich and gooey little fried mushroom balls, served on a cute bed of pine needles. 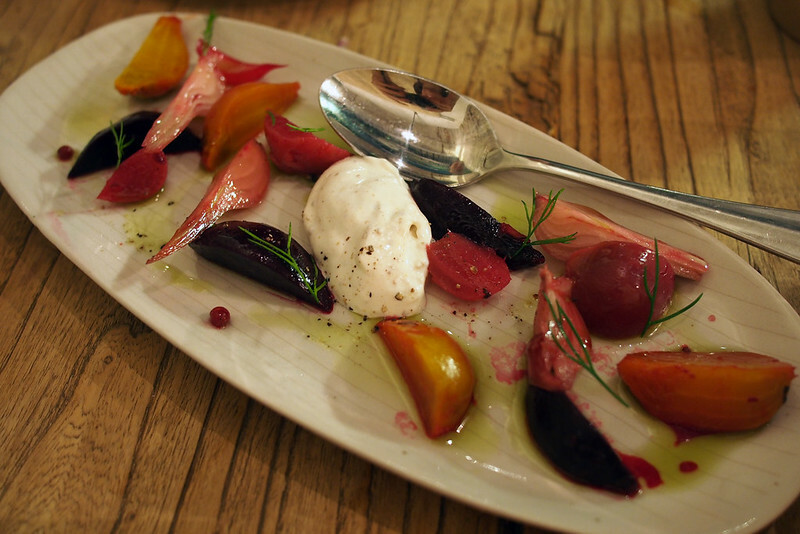 Beetroot with goats curd and pickled onion is a modern classic combination and didn’t disappoint. As the tasting menu wore on however, we started to get that unpleasant clashing of extreme flavours, and I started to crave something bland like chips to offset it all! 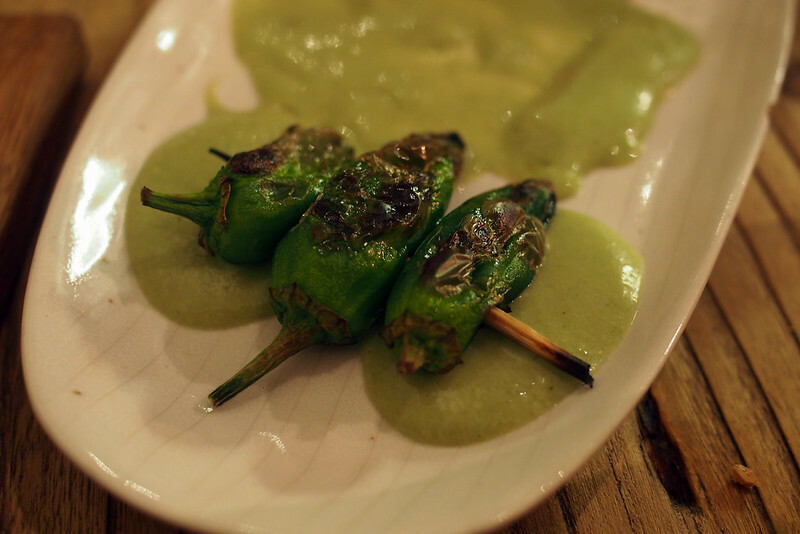 Some dishes just didn’t work for me at all: radishes were served with raw red onion, a cream with no trace of the promised horseradish and, bizarrely, padron peppers with a gazpacho sauce on the same plate. The main dishes were probably the most disappointing, and by this point two hours in we were starting to lose interest anyway. Lentil dal was fine but ruined by overly bitter green peppers on top. 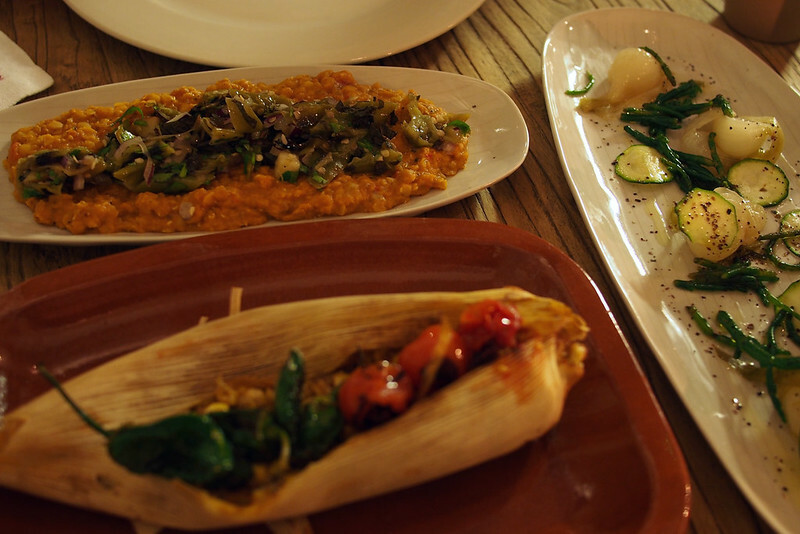 A dish of corn husk stuffed with corn and quinoa was oddly sweet and decorated with more unnecessary padrons. Most bizarre of all, we got a third plate of literally just cooked onions, slivers of courgette and samphire – the lamb was missing because we’d asked for a vegetarian tasting menu, but I assumed we’d get proper veggie options rather just missing the key component off another dish. A horribly chalky tapioca pudding for afters didn’t serve to remove any of the lingering aftertastes and was left barely touched by both of us. To end on a positive note though: the cocktails, curated by Zetter and 69 Colebroke Row’s Tony Conigliaro, were most definitely the high point of the evening. 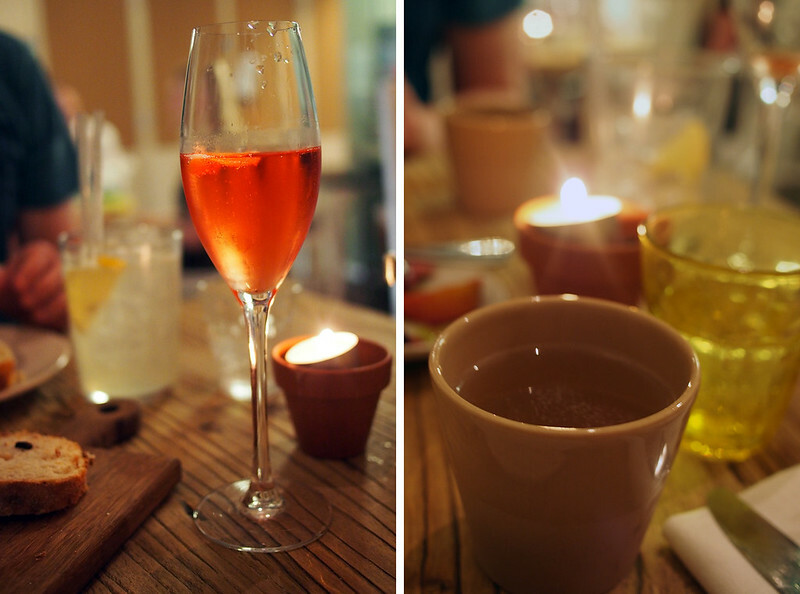 We started on a cedarwood sherry concoction for Josh and a Campari champagne cocktail for me, and then moved onto the excitingly unusual Greco Roman wines: I had a honey one and Josh had smoked paprika. They were well priced at £6.50-£7.50 each and really saved the day. 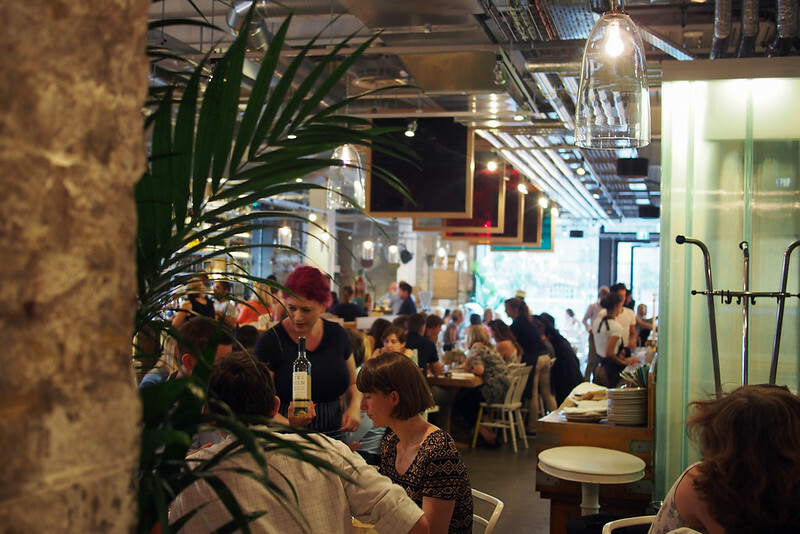 This review is written in partnership with match.com‘s London dating guide, and they requested I write about the restaurant’s suitability for a date night. In theory, I think Grain Store would be a great date spot because the unusual flavours and sharing plate concept mean you have plenty to talk about and interact with. Josh and I usually love to go to places like this because we can try twice as much food by ordering different dishes and sharing. The super cocktails will mean you feel relaxed and can begin and end the meal with a leisurely drink – there’s a nice dedicated bar space bar space to unwind in. The whole space is elegant yet informal with an outdoorsy vibe, ideal for a warm evening. Despite my misgivings about some of the menu – especially as a vegetarian hoping for a revelation – I still think Grain Store is a unique and interesting restaurant with something new to offer. 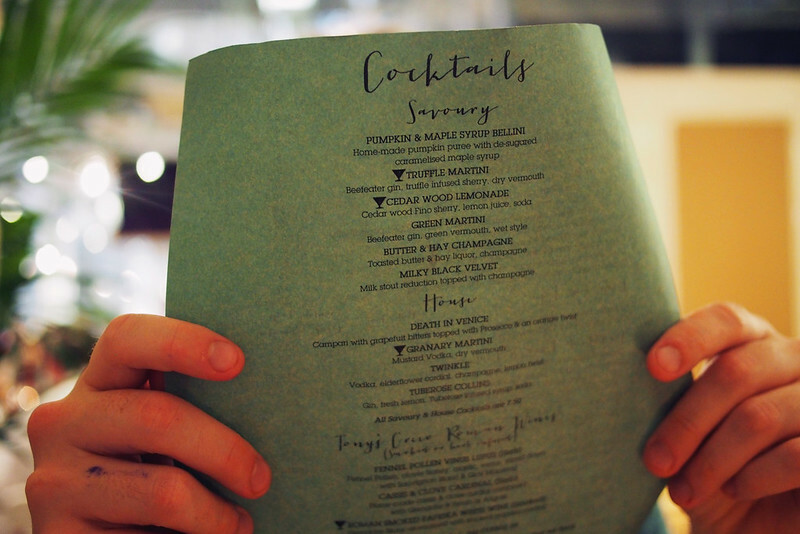 The veg-first menu concept is a great one and I suspect we would have enjoyed the meal much more if we’d picked our own dishes and had something more to our personal tastes. I wouldn’t hesitate to go back and try the delicious sounding brunch menu either. Grain Store, Granary Square, Kings Cross. My meal was paid for by match.com in exchange for this unbiased review. Thanks, Match! This place looks great, the food and presentation is just gorgeous! Ohhh! First of all, your photo’s are incredible – you’re very talented! second of all, I am hungry. 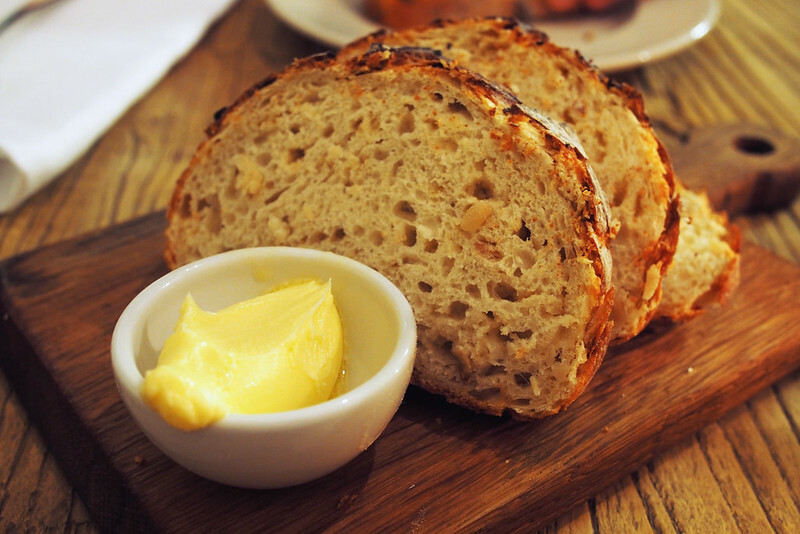 I have been dying to try the Grain Store, so thanks for the honest review. I still desperately want to try their dishes but will choose my own dishes rather than try the tasting menu. 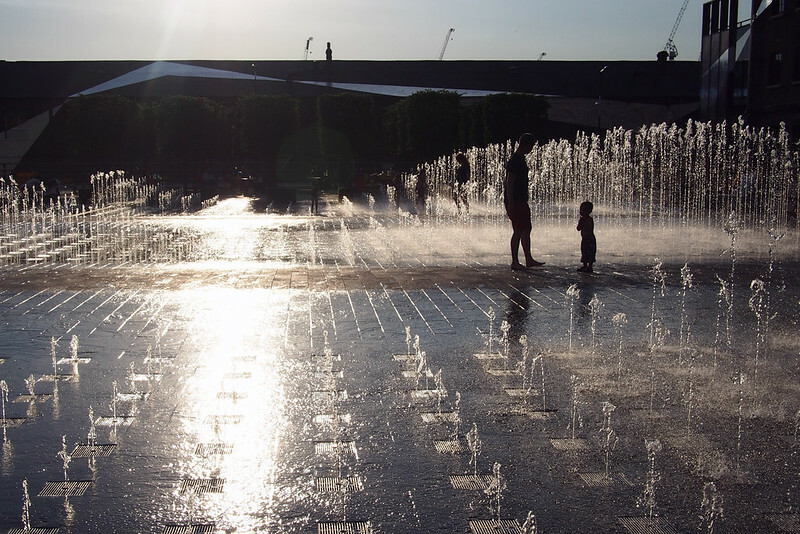 I am so excited by Kings Cross’ regeneration. It is my neighborhood so I feel very proud!